A brand-new edition of this best-selling guide to over 1,500 first names. Gem Babies' Names gives the origins of each name, and also lists the most popular girls' and boys' names in Britain today. 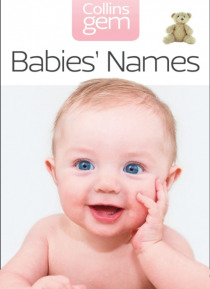 The ideal pocket guide to choosing a name for your baby.Have you recently named your child Emily or Jack? If you have, you have chosen the most popular name in England and Wales in 2003. Emily replaced C… hloe after five years in the top spot, whilst Jack has been the top name for nine years. Ellie and Chloe came next for girls and Joshua and Thomas for boys. In Scotland the top names for girls were Emma, Ellie and Amy and for boys Lewis, Jack and Cameron.This updated edition lists all names alphabetically, giving a pronunciation guide, background to the origins of the name and any pet names or related names.Sikh, Hindu, Muslim, Afro-Caribbean and European names, as well as Christian names, are all included.A guide to registering your baby's birth and points to consider when naming your child, plus lists of the most popular girls' and boys' names, complete this comprehensive guide to first names.This edition has been redesigned in the new Gem style both internally and with a new cover design.